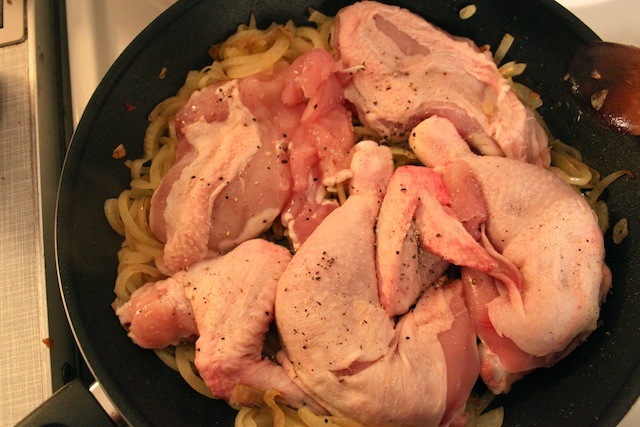 The Appropriate Emoticon for a Butchered Chicken is :o – Eat Me. Drink Me. I will admit: I am an ungainly chicken partitioner. Don’t tell anyone, but sometimes I dig out the lower piece of breast with my fingers because I can’t figure out how to get a knife into that strange curved dip of bone. I can never remember where the drumstick ends and the thigh begins or whether there’s a better way to cut along the ribs. And then there’s all that dangling. I try to do my butchering in secret, so that no one else must see the shame of what is really all that the connotation of the word butchering implies. 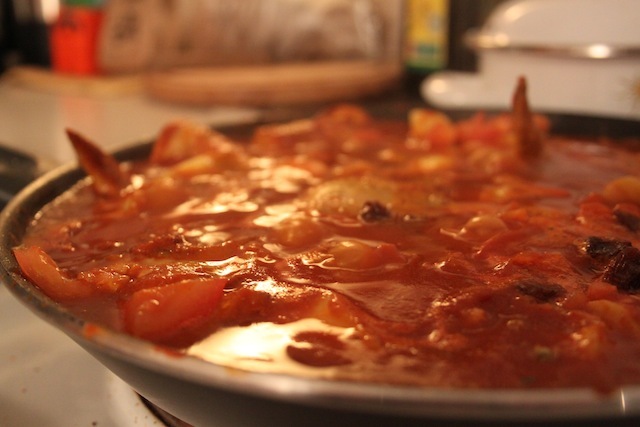 I like to have my guests walk into the kitchen with the pan of Nepali chicken curry contentedly bubbling like the La Brea Tar Pits on the stove. The dinosaur extinction scene is just too painful to watch. You might say, it’s just lazy, not to explain how Gregor Samsa ended up in your living room. Partly, it’s a matter of phone bills. Mostly, it’s a matter of medium. A text is not a letter. A text is a means to make plans, convey brief bursts of emotion, find each other in a crowd. A chat is quick communication – you don’t have hours to formulate your thoughts, nor do you have a person in front of you whose facial expressions you can read or whose vocal intonation you can hear. Without the ability to analyze a person, emoticons become necessary in order to quickly convey sarcasm, sadness, glee, humor, etc. without losing the conversation’s thread. Using emoticons is not lazy, but a skill. It takes finesse to know which pieces of speech are necessary and which can be replaced. In fractions of seconds, we take entire sentences, dissect them, and reassemble them so that they fit within a character-limited space. Of course, I doubt many people think about this process, especially many of the generation born with a cell phone stuck in their little baby fists. I can see how on some level, if you’ve never learned to communicate in complete sentences in the first place, there’s nothing behind an emoticon but a vapid, blank space. I’ve been told my conversations are discursive. As I sit here wondering how I’m going to get from emoticons back to chopped up chickens, I’m wondering if this habit of mine might need to be curtailed. But listen. Communication, whether written or spoken, involves arrangement and rearrangement. Our brains are processing how to say what we end up saying all the time – and depending on the medium we choose, recombining the same message in different ways. Think of a whole chicken as a segment of meaning. Your medium is Nepali chicken curry and your limitation is the size of a frying pan. So you cut the whole chicken apart into pieces and reassemble it so it fits snugly in the pan. It might have lost something (it’s dignity at the tip of my knife…) along the way, but its all still chicken – though in a format suited to the purpose. And emoticons in this analogy? I suppose you could say that’s the human touch – the way you puzzle the chicken pieces together, tucking wings under thighs, filling in the gaps so that the chicken still feels whole. I believe you have never been at a loss for words to express yourself. I agree that people need to verbally communicate more so we can look at their faces or hear their voices to more completely understand what they are trying to tell us. As you said, a text that says “I can’t be there,” can mean anything from someone is dying who needs me to I don’t want to be bothered with you.” How to stop those brief text messages? I don’t know. They text while they’re in school now. Babies will probably say, “MaMa” in text. It’s all up to the parents to take them away when they are together, so at least the family can communicate. Instead, each kid is on a separate phone having an on-going life with someone else who isn’t participating at home. It’s bad enough the countries of the world can’t communicate, but now the people and children can’t communicate with each other in the same house. What shall I eat and drink next week when I am in Tampa? do they have “good food” also there or shall I bring with me my own stuff?